In sadness. 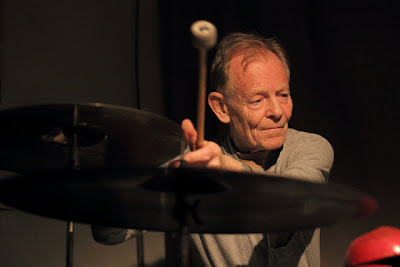 Oliver Weindling's blog is reporting the death from cancer yesterday of the ever-inventive drummer Tony Marsh. RIP. Oliver Weindling writes: "What a great man! He was a person who belied his age, playing through to his last weeks. Just recently playing with Roscoe Mitchell (reviewed HERE). He had what I would call a beautiful rolling style, with elegance and intensity. His great trio with Evan Parker and John Edwards sadly never recorded. It was a privilege to hear them every month. Next week's gig on 19th was supposed to be this trio. It'll be quite a night." Geoff Winston writes: "Whenever I saw Tony Marsh play he was, without fail, creative, constructive, versatile and a consummate technician – not a hint of ill health (to the public) - and, one could gather just by watching, a quiet perfectionist – even though he could make a racket if the situation demanded! One of the anchors and true leading lights of the London jazz and improv scene – those who played with him and those who came to hear him play will sense the void, but will treasure his legacy." Tony was a lovely man, always with time to talk when approached at gigs, unshowily knowledgeable on a range of subjects & possessed of a wry, often impish sense of humour. He's also a great loss on a musical level: few drummers have his wonderful touch, a sensitivity to the subtlest nuances of texture and dynamics, his ability to fit into a group sound with so little outward fuss and display. He'll be much missed. Really sad news. A great drummer with a beautiful sense of music. He will be very missed. Chris Parker says it so well. Tony had a unique drumming style, I always thought more funky than swinging, which I and many others found excitingly attractive. I hope that there are some recordings with Evan and John which will be released. Although they played together for many years, I'm ashamed to say I never saw them as a trio. I was only thinking the other day that I should make the effort, and now, alas, it is too late. A very friendly man and wonderful musician, he will be sorely missed. It Saddens me to learn of the death of Tony Marsh, a great musician and a man I have only recently befriended! RIP. In 1972 in Edinburgh drummer Bill Kyle (today the owner of The Jazz Bar) convened a meeting with pianist Jack Finlay, bassist Ian Croal and myself to discuss setting up the first-ever Scottish organisation to arrange conerts and tours by leading London-based and local jazz groups. Platform's debut project was a mini-tour by cutting-edge fusion group Major Surgery comprising Don Weller (tenor sax), Jimmy Roche (guitar), Bruce Colcutt (el.bass) and Tony Marsh (drums. They were magnificent with ingenious tunes, catchy riffs, sly time-changes and infectious rhythms, all propelled by the brilliant drumming of Tony Marsh. After moving to London the following year to work for the Jazz Centre Society I used to hear Major Surgery regularly at The Plough, Stockwell, and never ceased to be amazed by Tony's creative playing and his team-player approach to music-making. A lovely man and a great musician! I had the privilege to hear, meet and talk to soulful Tony in several occasion while in London. Wow! Let's celebrate life while we are alive. Many years ago Tony played with my band Naima on a tour of Holland. His wonderful playing, dry sense of humour and fortitude through temperatures down to minus 25C were a great source of inspiration to us all. I will always treasure my memories of this great percussionist with one of the most distinctive approachs in the history of jazz. I never met Tony even though he was my cousin - our fathers were brothers. During the last few years we spoke on the telephone and we swapped letters and some photographs. I know he was a lovely man and he was kind enough to keep in touch and I am so sad we never got to meet in person. I was amazed to see how like Uncle Fred he was, so I did feel like I knew him in a way. I send my heartfelt sympathy to Jane, Lizzie and all the family. I wrote another comment already but it's not showing up so trying again. I know it's a fairly slim chance that you'll ever even see this but I have to try. I'm in the same position as you. I never met Tony but he was my uncle, my fathers brother. I've been trying desperately, for some time now, to find and contact his family, particularly Lizzie who would be my cousin. I don't have a lot of family and I'm eager to be in touch with any that I might have. If you do see this then any sort of reply would be really appreciated. This is my only lead so far as to how I might find them. I would be happy to have any sort of information at all. Thank you. The first avant garde jzaa gig i ever saw was Peter Brotzmann, John Edwards and Tony Marsh. I was converted to that genere of music that night and have not looked back ever since. I remember Tony's facial expressions as he played - that of a man truly immersed in enjoying what he was doing. I was really sad to here about Tony. I am glad to have worked with him so much over the years with Harry B and just getting together for a play.He always took you on a incredible musical journey, a true improviser . His sound he produced on kit was unique , and really let a bass breath with his great interaction .On top of all this he was a smashing guy . Fred t Baker.